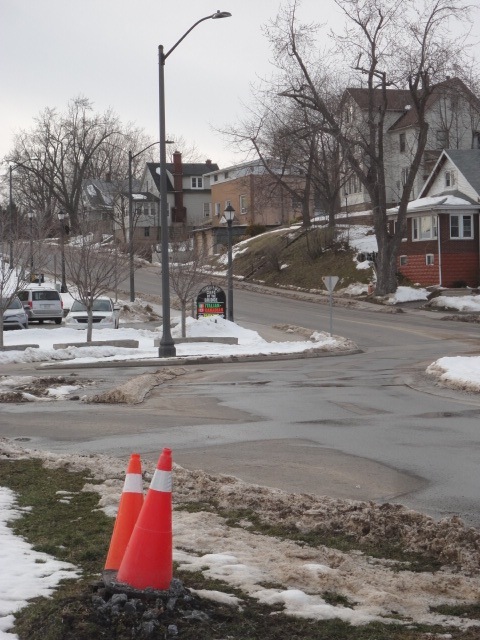 A Town of Fort Erie transit bus slid and crashed into a light pole on the Queen Street circle at Goderich Street Tuesday morning, resulting in the cancellation of service for the day. Pylons mark the location where a Fort Erie transit bus slid and crashed into a streetlight pole Tuesday morning at the circle intersection at the bottom of Queen Street. Freelance reporter Harry Rosettani heard about the mishap while at McDonald’s and took a picture for the Fort Erie Times which was published Thursday. Rosettani said no one appeared to be injured and that there might have been three or four people on the bus and the road was very slippery. He said it took a few hours, maybe more, to clear the scene because electricians from Toronto were required, but Rosettani didn’t stick around to know for sure. The Town of Fort Erie said Tuesday that buses were cancelled because of the weather. Drivers have complained that some of the roads on the bus route do not get plowed quickly. Queen Street features a steep incline with a “round-about” intersection at the bottom.